Join us Friday, October 25, 2013 as we celebrate UMass Amherst and 150 years of excellence. The University of Massachusetts Amherst is the flagship campus of this great Commonwealth. We boast of tens of thousands of loyal alumni. Help us celebrate our sesquicentennial in style. We’re bringing it to the streets. Enjoy the UMass Minuteman Marching Band performing on the steps of the State House. Cheer on the Power and the Class of New England as they parade through the streets of Boston to Faneuil Hall. Make the party official with a UMass Amherst birthday cupcake. Wear your maroon tie, dress or hoodie – just make sure you bring it to the streets. Show up. 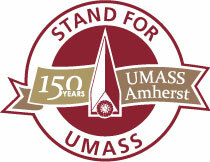 Stand for UMass. The celebration continues that evening at Boston Symphony Hall with Stand for UMass: The Concert. Enjoy the incredible talents of the university wind ensemble, orchestra, jazz ensemble, chamber choir, and the 400 strong UMass Minuteman Marching Band. Tickets are $30 and available online at http://www.bso.org/. 11 am: Special ceremony at the Grand Staircase at the Massachusetts State House, followed by a performance by the UMass Minuteman Marching Band on the State House steps. The Marching Band will then parade down the streets of Boston to Faneuil Hall.